Children Of The Night: Three Films About early 80s Goth Nightlife in the UK – Cleopatra Records, Inc.
Ah, if only time machines had been invented already. We would each be free to zip back and visit the desired nightclub/live venue/social scene of our choice, to revel in a world we can now only read, or dream, about. I�ve thought about this before, of course, and most of my preferred time travel destinations were located in and around New York City in the 70s and the 80s. But there will be many for whom the bright, shiny lights of NYC hold no attraction, and who would rather set the dials for the dark heart of Northern Britain in the early 1980s. These people will wear anything as long as it is black, enjoy nothing more than swaying to the heart-chilling sounds of The Cure, Joy Division or Bauhaus (possibly accompanied by nice pint of cider & blackcurrant juice) and can sometimes be spotted hanging out in mist-shrouded graveyards. 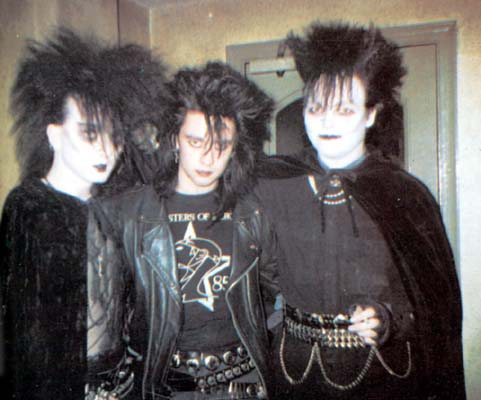 Yes, you guessed it, these people are Goths, and if you are one of them, then here�s a treat for you: three films chronicling the early 80s British Goth club scene while it was in its infancy. The received wisdom in the UK is that clubbing didn�t really exist here until after the acid house explosion in 1987/1988, with the notable exception of Northern Soul venues like The Mecca in Blackpool and the Twisted Wheel in Manchester. Well, these videos tell a very different story, displaying a flourishing alternative club scene that existed years before acid. Offering (mostly) untampered footage shot directly from the dance floors and stages of the best known Goth hangouts of the era, these films have the aura of gold dust about them. If that�s too bright and shiny for you, consider them excellent cultural curios that give a rare peek into a then-emerging subculture. These films, which vary in length from 8 minutes to over two hours, popped up on my Facebook feed this evening, so I decided to do the decent thing and group them all in a post for Dangerous Minds. Oh yes, 1983, when the media were all trying to figure out what came after punk�. Remember that the Batcave was born of punks and glam rockers, trannies, psychos and people turned away from other clubs – we let anyone in, trainers or no trainers, businessmen and dustmen, strippers and nuns�. …this film has been rescued from an old mildewed-and-damaged VHS cassette tape so the quality in the first few minutes is pretty poor, but it settles down fine just in time for the action inside the club. The original video was commissioned by the couple who ran the club (Annie and Pete Swallow) and was distributed amongst family, friends and regulars. We�ve managed to nail down, it cost �2 at the time. This is the complete full length video as originally presented. Goth culture is as British as warm beer and soggy rain, as quintessential as Heathcliffe on his merry moors, and it�s fantastic to see its beginnings documented so lovingly in these films. If The League of Gentlemen gang ever get a chance to check these clips out, they should kick themselves at never giving Royston Vasey its very own Goth club!